Maumee, OH – Spartan Chemical Company, Inc. introduces SparClean® Metal Safe Machine Dish Detergent, a powerful warewash formula that removes food soils and grease efficiently without being corrosive to soft metals like aluminum, copper and brass making it ideal for bakeries, grocery stores and other operations where soft metals are used. SparClean® Metal Safe Machine Dish Detergent is a non-chlorinated, low foaming, highly concentrated warewashing detergent for use in both low and high temperature dish machines. SparClean® Metal Safe Machine Dish Detergent strips away and emulsifies soils from pots and pans, trays, dishes, glassware, plastic, and utensils. Spartan Chemical Company, Inc. offers a complete line of warewash solutions including SparClean® Detergent II, SparClean® Delimer, SparClean® Low Temperature Rinse Aid, SparClean® Sanitizer, SparClean® Pot and Pan Detergent, and SparClean® Metal Safe Machine Dish Detergent. SparClean Metal Safe Machine Dish Detergent is available in 5-gallon pails, 1 gallon containers (4 per case) or 1 gallon F-Style containers (4 per case). 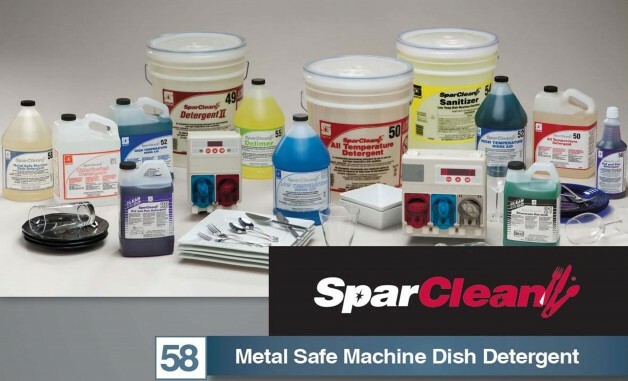 For more about SparClean Metal Safe Machine Dish Detergent visit www.spartanchemical.com. Spartan Chemical Company, Inc., with corporate headquarters, manufacturing and distribution facilities in Maumee, Ohio, is an international manufacturer of chemical specialty maintenance products.